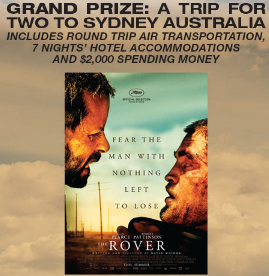 Cinemark “Rover” Sweepstakes – Win a trip to Australia! Win a trip to Australia & $2,000 spending money! ENTRY LIMIT – Limit: Each household may enter one (1) time during the Promotion Period. ELIGIBILITY – Cinemark/Rover Trip to Australia Sweepstakes is open only to legal residents of the fifty (50) United States (including the District of Columbia) who are at least twenty one (21) years old at the time of entry. SWEEPSTAKES PERIOD – The Sweepstakes begins on June 16, 2014 at 12:00 a.m. Eastern Time (“ET”) and ends on July 13, 2014 at 11:59 p.m. ET. PRIZES – ONE (1) GRAND PRIZE: Winners choice of a trip for two (2) to Sydney, Australia or a $4,500 check. Trip package includes: Round trip, coach-class air transportation for two (2) from a major airport near winner’s home (determined by Sponsor in its sole discretion) to Sydney, Australia; seven (7) nights’ accommodations at a hotel determined by Sponsor in its sole discretion (single room, double occupancy); ground transportation for length of stay; a two (2) hour Sydney helicopter tour for winner and guest; surf lessons for winner and guest; a two (2) hour sunset sail on Sydney Harbour for winner and guest; and $2,000 spending money. Approximate Retail Value (“ARV”): $11,585.